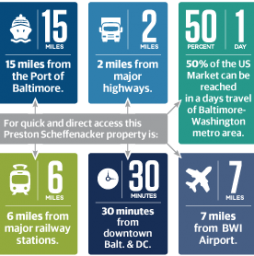 Preston Gateway is a 1.2 million square foot speculative development containing four industrial buildings ranging in size from 176,000 square feet to 314,000 square feet. Key tenants in Phase I of the project include the General Services Administration (144,386 square feet); Elite Spice, Inc. (169,464); and Owens and Minor, Inc. (223,871 square feet). In 2006, Preston sold its interest in Phase I of this project to Prudential Insurance Company of America, the company’s join venture partner. Prudential purchased the balance of Preston’s interest in the project in March 2008.